Below you will see a list of mostly “whole foods” that are keto friendly. Individual ratio and calorie levels will determine the quantities of foods allowed in a meal. Some people are more sensitive than others and will not be able to tolerate foods that are more processed. This is not a complete list of foods that can be used, as well as some foods may not be appropriate for everyone! 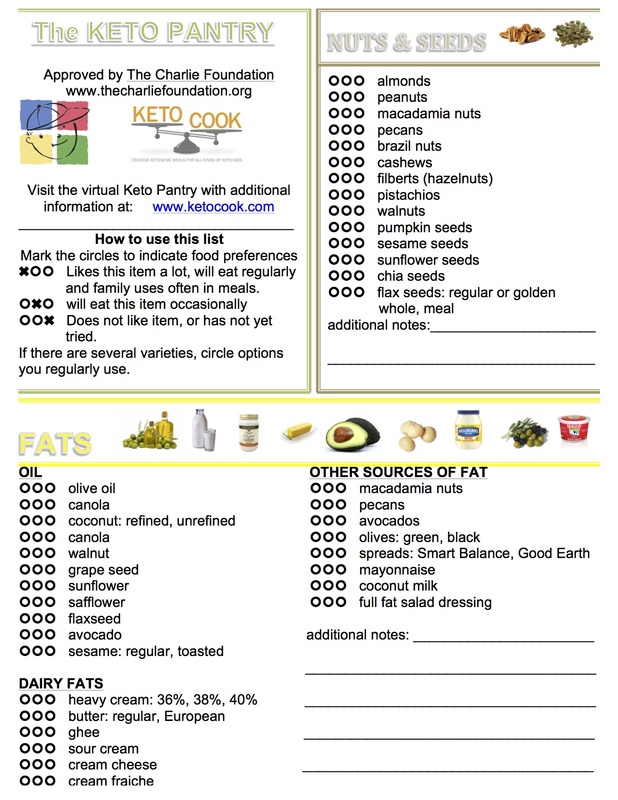 Prior to starting a ketogenic diet, use this list to notate food preferences. By providing your dietitian a clear picture of what your child’s likes and dislikes are will be very helpful in creating initial meals. If you have already started a ketogenic diet, use this list to expand your current diet. Find a vegetable or fruit that you have not tried and ask to, or create a new meal using that ingredient. Any diet, ketogenic or not, will benefit from including a wide variety of foods, especially fresh produce. Always consult your dietitian before trying a new ingredient! The “keto Pantry” section of this site will soon be expanded to include benefits and uses of these ingredients on the ketogenic diet! I’m confused by this list. Why is canola oil on the list? And that’s A LOT of fruit! I wouldn’t recommend someone new to keto go by this list. Classic ketogenic diets are not 100% sugar free. This list includes fruit because ANY carbohydrate can be calculated into a ketogenic meal plan, you will just get less of a higher glycemic fruit compared to a lower glycemic fruit (or vegetable). In many parts of the world, food availability and access is limited. It is common to include rice, corn, other starchy fruits and vegetables to achieve correct ketogenic ratios. There are many types of ketogenic diets, some versions restrict fruit and we know this works well, but I encourage you to consider how diet therapy works in less affluent locations/countries and take into consideration cultural preferences, tastes and traditions. Canola oil is on the list for many of the same reasons and in some cases one of the few oils widely available to someone who does not have access to higher quality oils produced and distributed in smaller quantities. It is also covered by benefits such as WICC, whereas other are not. I’m highly surprised that Canola oil is on this list. It is 100% not okay on Keto. It’s 100% ok for keto if it’s the only oil you can afford or have access to. No bananas… They are very high on the glycemic index scale along with other fruits like pineapple and mango. So why is mango on the list above? Yes, mango is high glycemic, however, each individual is unique as is their version of the ketogenic diet and how their bodies respond to different foods. Someone on a low ratio diet or modified version of the diet would possibly be able to include higher glycemic foods as part of their repertoire. It is best to eat a wide range of whole foods, hence the wide range of fruits and vegetables included in this list. Keto has almost no fruits. Maybe some blueberries and blackberries as they tend to be very very low calorie and sugar. But one apple is 20-40g of carbs..